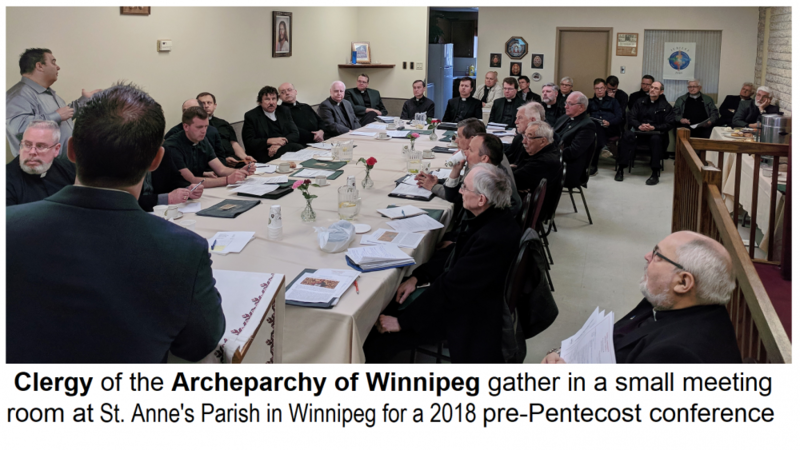 The clergy that serve the parishes of the Archeparchy of Winnipeg gathered in Winnipeg for a conference that touched upon an number of topics. The Parish of St. Anne in Winnipeg's North Kildonan area, where Fr. Mark Gnutel is Pastor, offered to host the conference. They not only provided the facilities, but also prepared an amazing lunch for the participants to enjoy before returning home after the sessions. 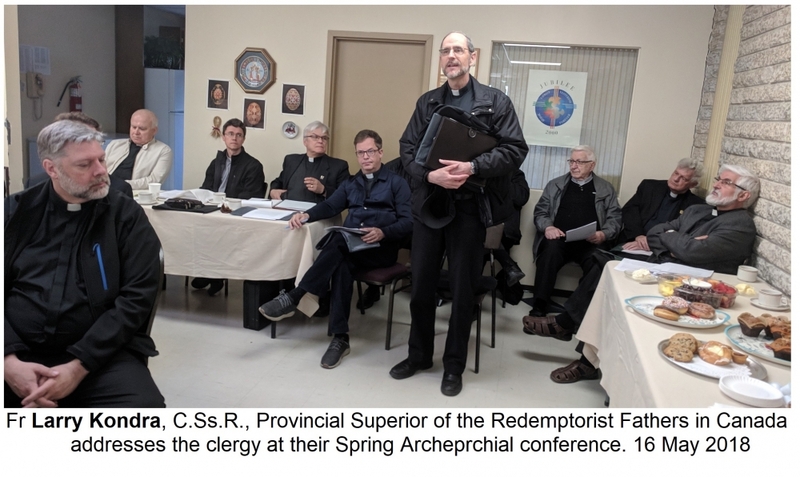 Metropolitan Lawrence opened the conference with a welcome to the clergy that had travelled from across Manitoba to attend. It had been a while since they had last gathered together and certainly not since making the spiritual/pastoral journey through the Great Fast and most of the Easter season. Spirits were high and they welcomed the opportunity to meet up with brother clergy and catch up on how everyone is and offer words of encouragement. In lieu of an opening prayer, the Archeparchial coordinator for the Vibrant Parish effort, Fr. Michael Kwiatkowski, led the attendees in a typical daily program Mission Days that are presently underway in all parishes throughout the Ukrainian Catholic Church. The one chosen was for the 4th Day "Branches that Bear Fruit" as it deals with the role of the bishop and parish pastors in the eparchy and the need to recognize the many talents of each and every member of the Church. What ensued was a series of presentations and discussions on many topics that included: the ongoing Safe Environments program in the parishes of the Archeparchy; the Archeparchial policy of Clergy being away from their parishes for vacations and other reason of absence; and the great number of possible changes to the Liturgical life in all parishes motivated by the new Particular Law for the Ukrainian Catholic Church that was promulgated in April. Fr. Gnutel also arranged an excellent presentation from representatives of the Berard Financial Group Ltd. who enlightened the clergy concerning particular realities about investments and their pension fund and benefits and other financial matters. 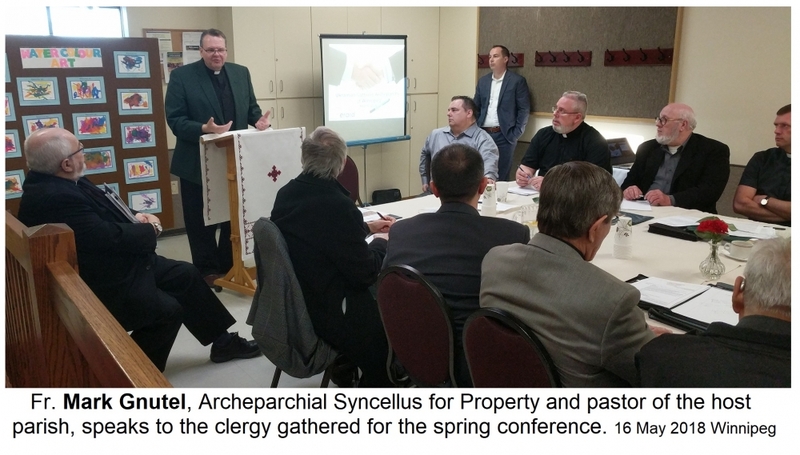 Metropolitan Lawrence also made informational presentations that included the transfer of Holy Spirit Inter-eparchial Seminary from Ottawa to Edmonton that is presently underway, and an update on the Trudeau Liberal government's decision to deny grants for summer student employment to communities that hold values contrary to those of the party presently in power. As is the tradition of the regular Clergy Conferences, following the sessions, everyone moved to the church where Fr. Djura Maljik led the Moleben' to the Mother of God, while Fr. John Sianchuk, C.Ss.R. led the responses. The ladies of St. Anne Parish served a much appreciated hot meal to the clergy before the latter said their goodbyes to return to their respective parishes. At the meal, Metropolitan Lawrence acknowledged all the clergy (a considerable number) that either celebrated a birthday or an ordination anniversary in May, he also thanked the ladies who served the meal with a traditional Mnohaya Lita. Everyone was also invited and encouraged to attend the special annual "Gospel of Life" Divine Liturgy that was being celebrated at St. Joseph Parish later that evening.